Home » 5 Freshest » Amy’s Crunchy Candy: Great Toffee. Organic too. Man I love English Toffee. Almond Roca: Yes. Heath Bars: Yes. Skor Bars: Yes. See’s Toffee-ettes. Another yes. Even when it’s just kinda good toffee, it’s good toffee. 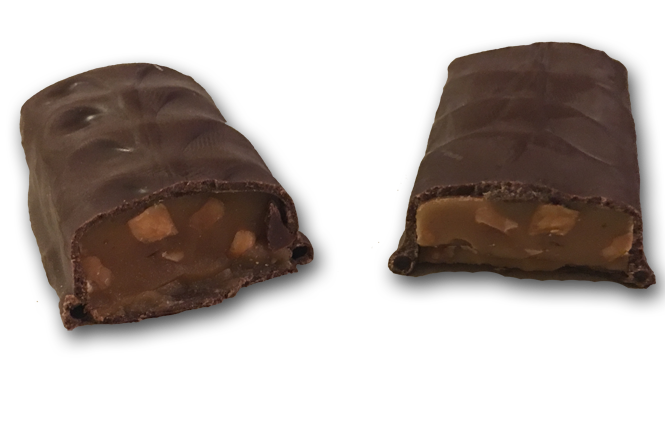 Amy made some of this toffee candy (after her Dad, Andy. But you can’t tell because the picture cuts off the name. See the whole darn package here.) and it’s damn good too. You know how toffee has this semi burnt caramel wonderfulness to it? So does Amy’s. You know how it’s got a bit of salt in there, and it’s nutty and hard – and then when you bite it kinda gets stuck in your teeth but not too bad, cuz now you also have some of the candy remnants for awhile after you eat it? Yeah Amy’s does that too. I pretty much couldn’t tell the difference between this toffee and a heath bar except the chocolate was darker, and the bar seemed thicker and less sweet in a way, which to me is a +1 over other toffee bars. But perhaps the real differentiator here is the ingredients. Amy’s is made with organic dark chocolate. This means all the parts of the chocolate (the cocoa, the sugar, the butter) are all organic. It’s also gluten-free – no wheat in this baby. And Kosher (although this is a strange one to me. Are other toffee bars not Kosher?). 1 bar is a fine amount to eat. I thought it would be too small but it’s surprisingly thick and dense. At 170 calories, it felt like more than enough (if you are counting). The only thing I didn’t love about this was the cost. I got the bar for $2.69, which isn’t that expensive when you get a big candy bar or a bag of gummies but seems pricey when you ‘re buying something the size of an under-sized regular Snickers bar. Still, these bars are top notch toffee, and I say they are worth every penny.